Actually, I’m not born in a historic family of tea ceremony although I am born and raised in Kyoto. In addition, I’ve never lived in foreign countries or study English at university. My major was law in university, so I learned English from elementary school to high school at home. Telling that, most people seemed surprised. 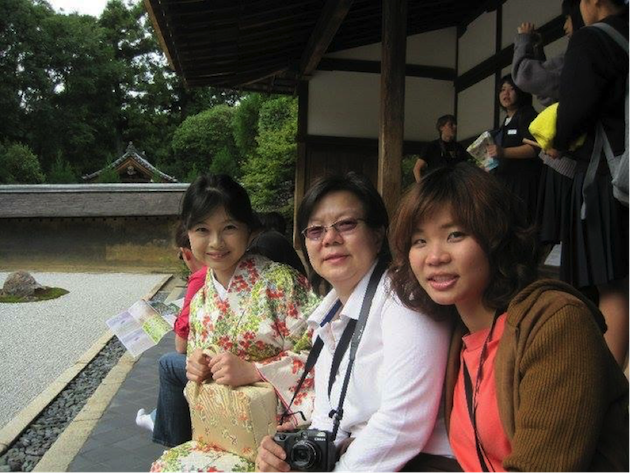 Why a common citizen raised in ordinary family like me started the tea house beside Kinkakuji temple? When I was 11-15years old, there was an old Japanese house many foreign people live together just a 1 minute walk from my house. 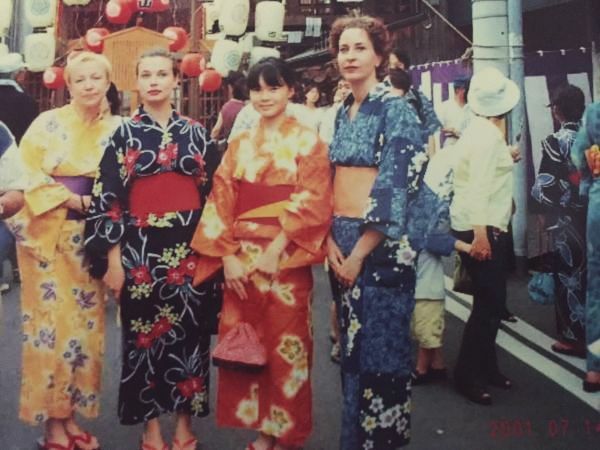 A German woman learning Japanese garden, a French woman learning Japanese binding, an artist from Denmark, a man from USA studying Japanese language, and Russian couple who can speak many languages. Japanese culture gathered people from all over the world to the small old house. They came to my house in turn to teach me English. Ladies from Europe speak very good English even though it’s not their own language. 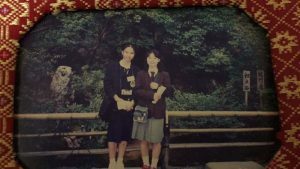 I sometimes go their house and had lunch together, visit their art exhibitions, and went Gion festival in Kyoto wearing yukata together. Unfortunately, I don’t know where some of them are and the old house is not used for shared house any more. But I remember I sent a calligraphy “heart” and origami when they flew back to their hometown. It was nice beautiful memories spending time with them. When I was studying English hard in the junior high school, an exchange student of the same age from Thailand stayed at my house. The girl became my best friend who I have continued e-mails and letters till now. We started to talk and write letters in English about how we have been getting along, cultures, climates, and events in each country. It incited our interests to know other cultures. One more thing I was surprised is she became good at Japanese. Started from Hiragana, she used Kanji soon, and I was really surprised she spoked perfect Japanese when we met in Tokyo 8 years later. Her warm letters and e-mails always encouraged me. I feel like she is always by my side even though we had less time to spend compared to Japanese friends. I think it’s because of her warm personality and cultural exchange that we have been getting in touch with each other for 15 years. It might sounds strange a young like me say such a thing, but the life is continuous ordeal. I remember 5years working in finance was miserable I was scolded by customers and superiors even I had tried my best. I didn’t like me feeling it’s unreasonable than reflections. Japanese culture such as tea ceremony, flower arrangement and kimono was one of the necessary helper in these days. Especially when I entered tea room, I felt like I was in another world escaping from the real world. Adjust my breath and heart, feel the seasons, and appreciate what I am now. 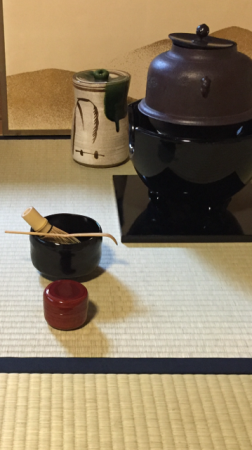 When I remember the feelings of a tea ceremony unexpectedly in a daily life, I can decide to do my best for my life. It’s not only me who feel Japanese culture as the mental pabulum. My best friend in Thailand feels same things through Japanese culture. “My life has totally changed since I went to Kyoto and met you. I always missed that time I was saying I didn’t want to go back home! I feel like coming back home every time I go to Japan. For me Japanese traditional art and culture are telling me the way of life, the way to understand ourselves from inside out through every object and detail, the way to be strong with kindness, the way to understand changes and differences, and not only the cultural heritage for one country but it’s needed for all mankind. 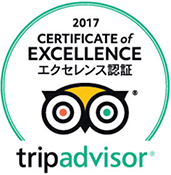 It is good memories to spend time with foreign guest through Japanese culture such as tea ceremony, flower arrangement, kimono, calligraphy, and origami. I felt we could share fun together. I hope Tea Ceremony Koto will be the nutrition for your heart sometimes even after you go back home.